^ "Population and Housing Unit Estimates". www.census.gov. Retrieved June 9, 2017. ^ "About Kalona". Kalona Chamber of Commerence. ^ Steven Dale Reschly: The Amish on the Iowa prairie, 1840-1910, Baltimore and London, 2000, pages 163-4. ^ Dorothy, Schwieder, Tom Morain, A Peculiar People, Iowa's Old Order Amish, University of Iowa Press, 1975; page 5. ^ Third Annual Report of the Board of Railroad Commissioners for the Year Ending June 30, 1880. Des Moines: Mills, 1880, p. 133. ^ Travelers' Official Guide of the Railway and Steam Navigation Lines in the United States and Canada. New York: National Railway Publication Co., 1881, pp. 250-251. ^ The History of Washington County, Iowa: Its Cities, Towns, Etc. Union Historical Company. 1880. ^ Tom Savage, A Dictionary of Iowa Place Names, University of Iowa Press, 2007; page 119. ^ "Iowa Amish". Amish State Guide. Retrieved December 4, 2010. ^ "Kalona Historical Village and its Museums". www.kalonaiowa.org. ^ Harry H. Hiller. "The Sleeping Preacher: An Historical Study of the Role of Charisma in Amish Society". Pennsylvania Folklife, vol. 18 (Winter 1968/69), p. 12. ^ Jennifer Borash (2008). "Mixing farming and music: Bontrager family lives out their two passions". The Dairy Star. Sauk Centre, Minnesota. Retrieved April 30, 2016. 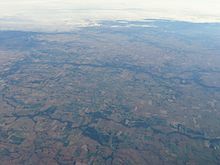 Wikimedia Commons has media related to Kalona, Iowa.